I was on Facebook one afternoon when a friend posted that they were enjoying listening to music on Songza while at work. I’m one of those very very lucky people to have my own office and so I often listen to music as I’m doing my standard correspondence or responding to emails. Up until recently though I was streaming radio station music, which unfortunately was full of commercials, and played the same songs over and over. With low expectations I decided to wander over to Songza and see what it was about. You can choose to listen to a pre-made playlist based on your activity for that time of the day with their concierge service (which is like having a boyfriend make you an awesome mix tape)! Or you can browse hundreds of playlists, and even see what type of music your friends are listening to! Can you tell I am obsessed? If a song comes on that you don’t like, you can choose to either dislike it or skip it. There’s a certain d-bag singer who beat his girlfriend that I refuse to listen to, so this comes in handy! This service is completely free, and you can listen through their site http://www.songza.com or through one of their apps for iPhone, iPad, Kindle and Android. I think one of the reasons why I love it so much, is because it’s so simple to use and because I’m listening to great upbeat music which is leading to me being more upbeat! Not to mention the daily dance parties that Baby J and I have! 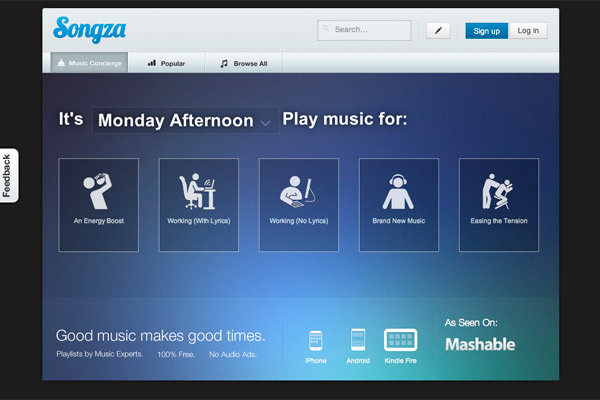 I truly believe that the way DVR/PVR changed the way we watch television, Songza is going to change the way we listen to music. This entry was posted in Reviews and tagged Android, Facebook, Internet radio, IPad, iPhone, iTunes, music, Playlist, Songza by shwetasays. Bookmark the permalink.